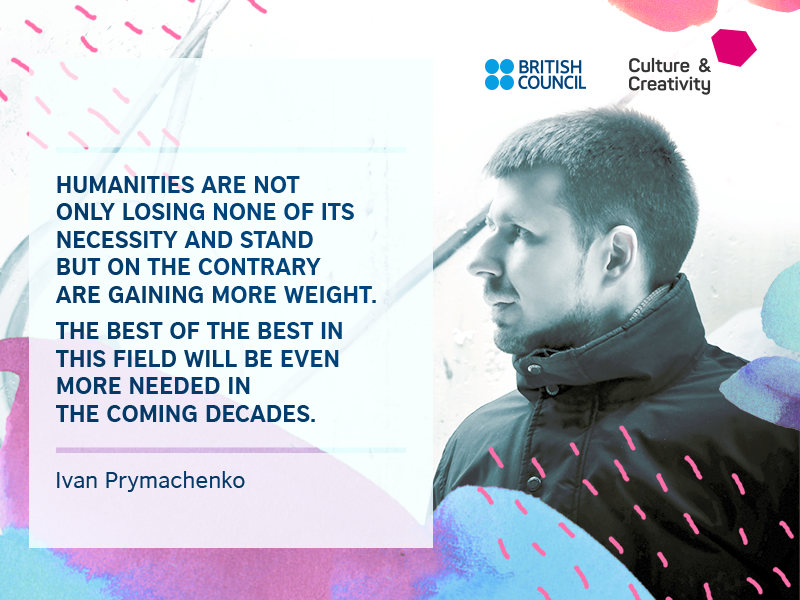 Ivan Prymachenko shared with us his opinions as to what role humanities will play in the world of technologies, what should be the starting point for the reforms in education and whether online learning could get you self-organised and more self-responsible. If you look at educational reforms we are witnessing in different countries, you can easily distinguish a certain pattern: almost everywhere we look, the starting point for the reforms was a crisis acknowledged either by a minister or reform initiators. If you fail to measure your bottom lines at the very beginning, it will get harder to do it the further you go. For example, quite a logical question in this circumstances would be: if things are so desperate is it worth trying doing something new? The education is about generating a certain environment where a person from his/her earliest years is shown what is right and what is wrong, what should be done, and what must be avoided. This is the basis. It is indeed rather difficult to explain anything about corruption consequences to those who did 11 years of school, then 6 more at the university where cheating, giving small bribes and plagiarism are only the most common practice, if not a norm. When person lives and operates for 17 years in such a system, there's no wonder he/she will be quite tolerant of corruption. Why tolerant? – Because the person grew up in this corruption-supportive system. While this system, wherein you are able to do what you wish with absolutely no responsibility for your actions, is breaking people. There are numerous aspects to be considered. First and foremost, this is a total reshaping of the pedagogical education and teacher training. Presently we are facing a phenomenal situation when applicants with low grades are applying to get into pedagogical universities. Meaning, the people who poorly know the subjects themselves are planning to teach them to others. It is strategically important to acknowledge this crisis and to reshape Ukrainian pedagogical curricula, to bring them in line with international standards. And scaling here is quite important. There is commonly accepted idea by the educational community, that focusing on local initiatives is a marvellous approach. Indeed it is beneficial, though on the other hand, we should do everything in our power to not only ensure that certain schools and regions get access to high-quality education, but that education in general is accessible for everybody. Of course, this is a super-challenge. I personally am not over-optimistic, it will take more than a year. But we already have certain results. If you push the ideas from bottom-up, document them, get into the public service yourself than indeed there is a chance for changing the situation in a centralised manner. The lion's share of all the discoveries the humanity is about to make will be based on technologies, namely, on artificial intelligence. However, one should understand that in order to develop them efficiently and effectively, we need classical humanities in place, starting from old good ethics. Not so long ago we faced a massive ethical challenge in social networks: who owns the data, what companies can do with it? What cannot they do? And how to regulate all of this? People started to get concerned when they figured out how much information they are providing to the third parties. In this way, the ethical problem of theoretical humanitarian nature turned into a practical realistic matter of concern as through manipulations with these very data populists can even get to power. Classical skills like ability to analytically read and learn, ability of critical thinking, that has always existed at the crossroads with philosophy, are getting more and more important. Machines are incapable of philosophical thinking. That is exactly why I sincerely believe that humanities are not only losing none of its necessity and stand but on the contrary are gaining more weight. The best of the best in this field will be even more needed in the coming decades. Here comes yet another challenge — technologies generate new markets where the winner takes it all. In other words, we need no second or third rate social network any more. What we need is the one that unites the largest number of people and is the most user-friendly. The others are left with less space and less work (especially well-paid work). If you can hire the best ever designers in the world to create some i-phone, that will have hundreds of millions of users around the globe, what other designers are left with? Of course, it's my over-simplified vision of the future. Nevertheless, it is still a real challenge. When best specialists in their field, namely in humanities, are getting over-influential and super-rich because they can scale-up their performance outputs for billions of people, than there is logically less and less space for middle-level specialists. It's better for the best and for users. But the question is: is it better for those who qualification-wise are in the middle or even lower? They are losing their jobs in most of the fields. And this generates additional social tensions. We are not used to this. We have grown with the understanding that we have to work to sustain ourselves. Indeed, every era had its own super-rich, who would, let's say, inherit a fortune and would not need to work at all. But they are just a few. So what will happen, when we have hundreds of millions of those who do not work at all? This is also a question to be solved in the field of humanities. When faced with economic crisis, people think more about economies; when in a state of war – it is war that is on our minds and we are pondering on the matters of life and death. When we solve our front-line problems, then I believe we are going to have some time to spend on culture. Perhaps, it might turn into a front-liner. At present the Western world sees such a phenomenon as cultural wars, when different values and visions of what should be the way for our society to evolve, are colliding and turning into the majour drivers, including drivers of political processes as well. There are two benefits to this process. For instance, you can easily study IT online, enjoying the access to the leading universities and teachers around the world. As for medical sciences, here you can go online only for the theoretical part, the practice will have to be exceptionally off-line. But most of the disciplines are somewhere in between these two polarities. And all of them are only benefiting from a mixed-mode of education that allows you to combine the best elements of both of the formats. If we take the online mode, her we will have the best teachers in the world, interactivity, the possibility to do some quite illustrative things and visualisation. With the off-line mode you get group work, individual consultations and mentorship. The mixed mode is an inevitable way to go. The question is how to transform a school or a university from the level where it is only strict algorithms, dry knowledge and facts that are taught, into a place where the focus is on metacognitive abilities, independence, psychological self-regulation, teamwork and leadership. Living in Ukraine you can quite easily get a free place at the University applying literally no efforts to achieve this at all. It's a huge problem. People start seeing education the same way Soviet tourists would understand the concept of a buffet. They are going for the higher education not because they need it, but because it is given to them - so why say no to such an offer? As a result we have quite a number of students who are not enjoying their studies, as they are not interested, they don't want to make an effort and they are not making it. It is not because they are stupid or anything, they simply do not need it. However they are spending huge amounts of state funding which could have been readdressed to raising salaries, purchasing new equipment for labs, etc. You are always paying for your education. It has to be paid either by the person him/her-self, or by taxpayers, or some sponsors, or donors. Even if these are courses delivered by volunteers, they are still paid for by those volunteers in their efforts and time. An this must be made clear and understood. Norayr Yerznkyan: "Culture has turned into a way of voicing protests, signaling social changes and expressing beauty"